It’s time to stop worrying about the safety of your family and pets, your valuables, and your home, and to start protecting them. A smart home security system will help you monitor access to your home, track events inside and around your home, and much more. Children. Automated security features can monitor and protect them at home when you’re gone (or even in another part of the house). It can alert you when they’ve arrived home safely from school, and confirm that they’re getting down to their homework or chores—not watching TV with their friends—or worse. Seniors Living Alone. Make sure that Grandpa is eating regularly, drinking enough fluids, taking his medications on schedule, sleeping soundly at night, and locking the doors appropriately—even when you can’t be there to help. See Medical Monitoring, Aging-in-Place, Security Cameras: When Visual Data is Essential, Surveillance: Balancing Safety & Privacy (coming soon). Sensitive Areas. Use Access Control to keep children and other unauthorized persons out of the medicine, alcohol, and firearms cabinets. Trust is good, but access control is much better. Whether you live in a high-rise apartment or sprawling ranch, smart home security offers protection that will help you safeguard your family and valuables—so you can relax. 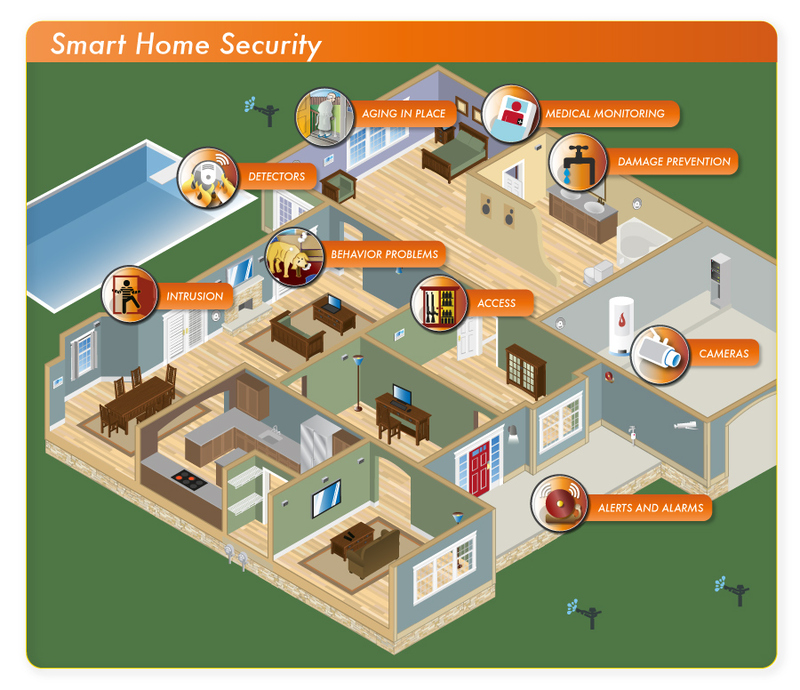 Click on an icon below to learn more about Smart Home Security, Entertainment & Automation, or Smart Energy Management.